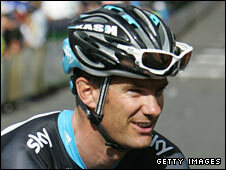 New British cycling outfit Team Sky had a dream debut on Sunday with a one-two finish in their first race. Greg Henderson edged out team-mate Chris Sutton to win the Cancer Council Helpline Classic in Adelaide, a warm-up for the season-opening Tour Down Under. "We joked that the best way the team could put themselves on the map is the first race we get together, we end up winning," said New Zealander Henderson. "That happened, it was unbelievable. It doesn't get any better." HTC-Columbia's German rider Andre Greipel was third after putting in a late surge, which the Sky pair held off. They moved into the lead of the street-circuit race with three laps to go, hauling in a breakaway led by two former Tour de France winners, Oscar Pereiro and Lance Armstrong, competing for his new Team Radioshack. Australia's Robbie McEwen came fourth with reigning Tour Down Under champion Allan Davis in seventh. Armstrong finished eight seconds off the pace in 55th place, with Australia's world road race champion Cadel Evans 78th and Pereiro 99th. The Classic is a stand-alone prelude to the six-stage, 800km Tour Down Under, which starts on Tuesday, and the last two riders to win the Classic - Greipel and Davis - have subsequently gone on to win the Tour.